Cork played with the aid of strong wind in the first half and by the quarter of an hour mark found themselves three points to the good – thanks to a trio of placed balls from Orla Finn. Mayo did have chances themselves in the opening quarter putting three efforts the wrong side of the posts before Finn found her range for the visitors. Cork were unlucky to not get in for a goal in the middle of their run of three points with Niamh Cotter pulling an effort wide of the post after finding herself in acres of space in the heart of the Mayo rearguard. Mayo got the scoreboard moving in their favour on the 16 minute mark when Grace Kelly slipped over a free from close range and he hammered over a long range placed ball four minutes later to cut the gap back to a single point. But Eiphie Fitzgerald’s side were about push themselves into a decent lead Cotter making amends for her earlier missed goal effort finding the back of the net from a close range effort that caught Michelle Tracey unawares. That was followed by a points from play from Ciara O’Sullivan and Doireann O’Sullivan and another Finn free with Mayo hitting back in the middle of that run through another Kelly pointed free to have Cork up by six points on a score of 1-6 to 0-3 on 26 mintues. Mayo weren’t going to let Cork run away with it though at this stage and two points from Kelly had them back within four of their guests and just before the break Tamara O’Connor was hauled to ground and Mayo were awarded a spot kick. Rachel Kearns saw her effort saved by Martina O’Brien, but Emma Needam was quickest to react and poke the ball over the line. Cork saw Ciara O’Sullivan sinbinned for the foul for the penalty and she was joined in the bin by Daire Kelly on the stroke of half time giving Mayo a two person advantage for the opening stages of the second half and trailing by just a single point. Depsite having the two player disadvantage at the start of the second half it was Cork who came roaring out of the blocks and had extending their lead to four points by the 36 minute mark with Finn slotting over a free and an excellent score from play, with Doireann O’Sullivan getting her second of the day. Mayo did make their numerical advantage count when Niamh Kelly picked out Sinead Cafferkey with a great ball and she hammered it home to the back of the net. But their joy lasted all of 30 seconds as Cork went right down the field from the restart and Doireann O’Sullivan rattled the back of the net for Cork’s second goal from close range to leave the visitors leading 2-9 to 2-5 with ten minutes gone on in the half and Cork restored to the full complement. Cork pushed that lead out to six points for the second time in the game by the 43rd minute with Finn tapping over a score from play and another free to leave Mayo with a serious mountain to climb over the final quarter of the game. Both teams were reduced to 14 when Kathryn Sullivan and Doireann O’Sullivan were sent to the sinbin after the tangled under the nose of the ref on 47 minutes. 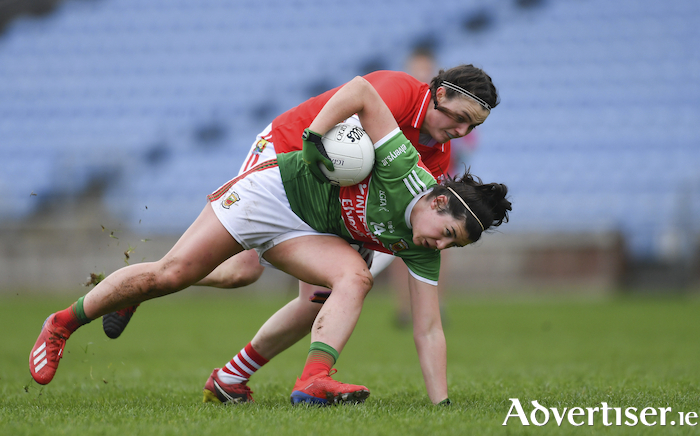 A minute later Mayo introduced the returning Rowe to the action as they looked to try and drag themselves back into contention, but Cork went on and stretched their lead out to seven points through a Rhona Ni Bhuchalla point from close range. There was no way back for Mayo after that and Cork eased their way to victory with Orlagh Farmer running in their third goal right on the stroke of the end of normal time. Cork: M O’Brien; E Meaney, H Looney, M O’Callaghan; D Kelly, M Duggan, E Kiely; A Hutchings, E Spillane; C O’Sullivan, N Cotter, O Farmer; E Scally, D O’Sullivan, O Finn. Subs: R Ni Bhuchalla, M Cahalane, L Cleary, S O’Leary, C O’Shea.